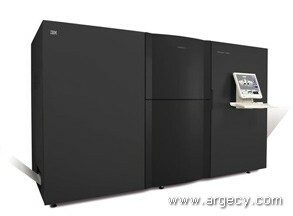 The 5101 InfoPrint Solutions Company, a Ricoh-IBM joint venture, continues to lead the digital printing industry with the InfoPrint 5000 full-color continuous web printing system featuring Advanced Function Printing (AFP)(TM) support. The 5101 Infoprint 5000 Model AS1 is a high speed, high quality simplex printer. The 5101 Infoprint 5000 Model AD1 is the first engine of the AD1/2 high speed duplex printing system. Model AD1 does not contain its own control unit and therefore must always be used in conjunction with Model AD2. The 5101 Infoprint 5000 Model AD2 is the second engine of the AD1/2 high speed duplex printing system. Model AD2 contains the Control Unit and is used to print side-2 in duplex mode by mating with the AD1. Print speeds up to 209.9 linear feet per minute (up to 916 impressions per minute (ipm) (1) in 2-up duplex 8.5 x 11 in portrait) or 64 linear meters per minute (up to 862 ipm in 2-up duplex A4 portrait). Note: (1) Exact speed varies depending on document complexity, system configuration, software application, driver, and printer state. The Infoprint 5000 Model AS1 is a high speed, high quality simplex printer. The Infoprint 5000 Model AD1 is the first engine of the AD1/2 high speed duplex printing system. Model AD1 does not contain its own control unit and therefore must always be used in conjunction with Model AD2. The Infoprint 5000 Model AD2 is the second engine of the AD1/2 high speed duplex printing system. Model AD2 contains the Control Unit and is used to print side-2 in duplex mode by mating with the AD1. Models of the InfoPrint 5000, the AS1, AD1, and AD2, incorporate the AFP benefits of page-level error recovery and data integrity critical for variable data printing with the existing InfoPrint 5000 benefits of speed, quality, reliability, ease-of-use, and auditability. These new models also offer native support for applications that utilize PostScript and PDF datastreams and Encapsulated PostScript and PDF objects embedded in AFP/IPDS datastreams. The InfoPrint 5000 is designed to fulfill the requirements of transactional printers, service bureaus, direct mailers, and some book printers. These InfoPrint 5000 models support the open, industry-standard AFP Color Management Object Content Architecture (CMOCA) published by the AFP Consortium to provide accurate, consistent, and device-independent color rendering. The AFP controller adds IBM POWER5(tm) System p5 technology to the IBM BladeCenter technology used in the current InfoPrint 5000. This provides a high-performance architecture to exploit Linux and dynamically allocate blade resources to efficiently process AFP objects. The InfoPrint 5000 continues to fill the gap between previously available industry color offerings with very high quality but low speed and high cost, and alternatives that feature lower quality but very high speed. With the InfoPrint 5000, you can now expect to effectively and confidently print large volumes of variable data documents (like statements) in full color, with the security and controls you are accustomed to in your AFP output environment. The InfoPrint 5000 utilizes innovative piezo-electric, drop-on-demand inkjet technology with water-based pigment inks that are resistant to fading and smearing, even on commonly used digital papers. Using the InfoPrint ProcessDirector for high-speed production print environments, the InfoPrint 5000 can provide a customizable process management system that automates many tasks that have previously been handled manually. In addition to InfoPrint ProcessDirector, the InfoPrint 5000 can also be driven using InfoPrint Manager and PSF 4.2.0 for Z/OS. All of these products are designed to improve the management of output environments, which can help clients reduce costs, improve quality, and seamlessly respond to changes in their processes. Similar to previous InfoPrint 5000 models, these models of InfoPrint 5000 are available in simplex or tandem duplex configurations. The system can print at speeds up to 209.9 feet per minute (64 meters per minute) or 916 full-color, two-up duplex letter-size ipm (or 862 full-color two-up duplex A4-size ipm). (1) The system has a 20.4-in web with up to 19.96-in print width, and is designed to deliver excellent print quality at 720 x 360 dots per inch (dpi) resolution. AFP Color Management is also supported by the InfoPrint 4100, enabling customers to develop a single color application and workflow that can be printed in color on the InfoPrint 5000 or in high-quality grayscale on the InfoPrint 4100. The InfoPrint AFP Resource Installer allows color management resources and color images to be installed in resource libraries that PSF 4.2.0 for Z/OS, InfoPrint ProcessDirector (IPPD), and InfoPrint Manager (IPM) can use to send color-managed AFP data to the InfoPrint 5000 and InfoPrint 4100. InfoPrint ProcessDirector for high-speed production print environments can provide the InfoPrint 5000 with a customizable process management system, automating many tasks that have previously been handled manually. In addition to InfoPrint ProcessDirector, the InfoPrint 5000 can also be driven using InfoPrint Manager, as well as PSF 4.2.0 for z/OS. These programs are designed to improve the management of output environments, which can help clients reduce costs, improve quality, and seamlessly respond to changes in their processes. The AFP controller utilizes IBM POWER5(TM) technology and IBM BladeCenter(TM) technology in a high performance page-parallel rip architecture. The controller exploits Linux and dynamically allocates blade resources to efficiently process pages and AFP objects for print. This scalable, cluster-based printer controller can accept AFP, PostScript and PDF datastreams, delivering high-speed printing to expedite job completion and enable consolidation of footprints. InfoPrint 5000 utilizes innovative piezo-electric, drop-on-demand inkjet technology with water-based pigment inks that are resistant to fading and smearing, even on commonly used digital papers. A tight paper web also contributes to the excellent ink jet print quality. The InfoPrint 5000 can run applications with exceptional print quality on paper typically used in monochrome electrophotographic printers, unlike other inkjet systems that typically require ink-jet treated paper to produce good-looking output. These models of InfoPrint 5000 are available in simplex or tandem duplex configurations. The innovative technology in the InfoPrint 5000 family is designed to deliver variable data, full-color output at a speed, quality, and price point that is unique in the industry. By leveraging the variable data color capabilities of the InfoPrint 5000, customers can provide their clients with output that can help to significantly increase response rates. The InfoPrint 5000 capabilities are designed to enable businesses to produce statements that incorporate customized marketing and promotional information. Additionally, the speed and quality of the InfoPrint 5000 may enable the migration of many offset applications to customized short-run digital output to improve turn-around times and reduce costs. The InfoPrint 5000 family of printers are designed for very-high-throughput color production printing environments. Ability to create device-independent colorized AFP workflows that can be targeted to an InfoPrint 5000 color printer or to an InfoPrint 4100 Printer without application-level changes. Support for AFP Color Management Architecture is standard on all InfoPrint 5000 model AS1, AD1, and AD2 printers and on all InfoPrint 4100 printers with the InfoPrint POWER controller and microcode release 15.4, and above. Color Management Resources (CMRs), which are part of the open, industry-stand AFP architecture called Color Management Object Content Architecture (CMOCA), are used to carry this color management information. CMRs carry all of the color management information needed to render a print file with color data consistently and accurately on both color and monochrome printers. Furthermore, CMRs provide the end user with system-level controls to fine-tune the output to meet their specific needs. This allows end users to get accurate and consistent colors on color printers, and accurate and consistent grayscales on 4100 printers. Furthermore, such device-independent print files can be archived with the assurance that the colors will be printed accurately on different color or monochrome printers in the future. Color Conversions (CC CMRs): These CMRs contain standard ICC profiles to define the colors in the print data and to support accurate color rendering and accurate conversions of the color data to grayscale data. Tone Transfer Curves (TTC CMRs): These CMRs can be generated and specified by the end user to modify the colors or grayscales that are rendered by the printer after the color-to-CMYK conversion or color-to-grayscale conversion. For example, they can be used to saturate a specific color in an image. The maximum print width of the InfoPrint 5000 family is 19.96 in (507mm). The following table shows the maximum print speed (in images-per-minute) of the InfoPrint 5000 Models AS1, AD1, and AD2. Note: (1) Resolution is in dots per inch (dpi). Note: (2) Impressions per minute. Actual throughput speed may vary depending on application design, connectivity, communication line bandwidth, and other variables. The InfoPrint 5000 uses an integrated tractorless paper drive. The tractorless paper drive allows either pinless or pinned paper to be used. Note that some pre-and post-processing devices require the use of pinned paper. Pre-and post-processing equipment that support a tight web is required for the InfoPrint 5000. A type 1 interface, modified for the InfoPrint 5000, is used to attach pre-and post-processing devices. Consult the pre-and post-processing device vendor for information concerning specific devices. The InfoPrint 5000 tandem duplex system consists of two printers (the AD1 with the AD2) that work together to print on both sides of the media. Duplex printing is achieved by arranging the two printers in series, separated by the "I" or "L" turnbar so that the continuous forms exiting from the first printer go through a turnbar that turns the forms over (inverts them) before entering the second printer. The first printer in the paper path prints one side of a form; the second printer in the paper path prints the other side of the form. The following table summarizes the turnbars required for the InfoPrint 5000 Models AD1 and AD2 duplex configurations. A web cleaner is included with the InfoPrint 5000. The purpose of this unit is to neutralize static and to clean paper dust and paper chads from the continuous form media prior to the media entering the printer. The Web cleaner with the correct voltage must be specified when the printer is ordered. The Web cleaner contains a universal attachment kit to allow its attachment to an unwinder; it is powered separately from the printer. Note: "All" refers to Models AS1, AD1, and AD2. The following must be included on all initial orders for a Model AS1. One of the following feature codes for the web cleaner (#9460, 9461, or 9462) must be specified. If applicable, the Chicago Printer 6-foot line cord (#9986) may be ordered. One of the specify codes for the appropriate turnbar (#9410 or #9420). If applicable, the 6-foot Chicago Printer line cord (#9986) may be ordered. This feature provides the capability to use dye ink on the InfoPrint 5000 Models AS1, AD1, and AD2. Cannot be ordered with pigment ink (#9220). Only one type of ink can be used in an InfoPrint 5000 printer. It is not possible to use both dye ink and pigment ink in the same printer. Printers cannot be converted from pigment ink to dye ink or from dye ink to pigment ink. No, this feature is only factory-installable. All ink colors are keyed so that they are installed in the proper bin in the InfoPrint 5000 color printer. Summary: This feature provides a turnbar for a duplex configuration in the In-line ("I") configuration. Summary: This feature provides a turnbar for a duplex configuration in the "L" configuration. Summary: This feature provides an additional blade processor to improve controller performance. It is recommended that performance testing be performed if possible prior to ordering this feature. Summary: This feature provides two Morisawa Fonts. These are: Gothic Medium BBB(TM) and Ryumin Light KL(TM). These fonts are for use with PostScript and PDF fonts. They can also be used by PostScript and PDF objects that are embedded in IPDS datastreams, but they cannot be used in IPDS except for the case of embedded PostScript and PDF objects. A U.S. Section 508 Voluntary Product Accessibility Template (VPAT) containing details on the product accessibility compliance can be requested via IPS's Web site. Production printers are, by their nature, complex machines that typically require specialized, trained operators. Because of this, there are tasks that cannot feasibly be redesigned to be accessible to everyone. A standard keyboard provides keys that are tactilely discernible without activating them. Paper width: 6.5 to 20.5 in (165 to 520 mm) tractorless. The InfoPrint 5000 has a print width of from 6.0 to 19.96 in (150 to 507 mm). Paper weights between 64 and 157 gsm (17 to 42 lb Bond) are supported. Recommended paper is 90 gsm or 24 lb. Paper should be tested with the targeted applications before production quantities are ordered. The InfoPrint 5000 printing system is designed to print on roll-feed paper. Certain applications may cause excessive wear or premature failure of some components of the InfoPrint 5000. In these situations, a customer with maintenance provided under the IPS Customer Agreement of IPS Machines may be responsible for additional maintenance charges. Bar codes should be tested on the target paper with the target application prior to implementation. The "I" Turnbar is available as a specify feature on an initial order, or as an MES feature. The "I" Turnbar is required for an in-line configuration. The "L" Turnbar is available as a specify feature on an initial order or as an MES feature. The "L" turnbar is required for a left-angle configuration. The InfoPrint 5000 fonts are listed in the Planning and Configuration Guide. The InfoPrint 5000 is designed for efficient ease of operation, service, and installation. Accepted human factors principles have been applied specifically to frequent access areas such as the operator interfaces. The operator flat-panel touch-screen, and associated keyboard and mouse, are provided to facilitate and enhance the human interface with the printing system. Please see the Planning and Configuration Guide for detailed information regarding weight, space, and footprint requirements. For more specific printer environment information, refer to the Planning and Configuration Guide. An integrated 10/100/1000 Ethernet Gigabit TCP/IP adapter is included with the InfoPrint 5000 Models AS1 and AD2. InfoPrint Manager for AIX V4.2 with PTF U815456, and later releases. InfoPrint Manager for Windows V2.2 with PTF UO00688, and later releases. The Advanced Function Presentation (AFP) Resource Installer V1.1 provides support in the above environments to manage AFP color management, font, and data objects required for advanced color and monochrome output. The AFP Resource Installer consists of a consolidated interface for the installation and management of AFP color-management, font, and image object resources. InfoPrint Manager V4.2 for AIX and InfoPrint Manager V2.2 for Windows provide the print server support for the AFP color management architecture, and support for AFP Color Management Resources. InfoPrint Solutions Company can now provide an end-to-end, managed workflow that makes high-quality color and black-and-white workflows a reality, with consistent results across a variety of devices that support the architecture. The InfoPrint 5000 Models AS1, AD1, and AD2 can print PDF Level 1.6 and PostScript Level 3 print jobs. Although an IPS print server is not required to print PostScript Level 3 and PDF Level 1.6 jobs on the InfoPrint 5000, it is possible to use this printer with IBM InfoPrint ProcessDirector for AIX, InfoPrint ProcessDirector for Linux, InfoPrint Manager for AIX, or InfoPrint Manager for Windows. IBM Print Services Facility for VM, IBM Print Services Facility for VSE, and IBM Print Services Facility for iSeries software platforms do not support the InfoPrint 5000 Models CS1, AD1, and AD2. The Infoprint 5000 Models AS1, AD1, and AD2 support outline fonts for both double-byte (DBCS) and single-byte (SBCS) character sets. Since outline fonts are scalable and resolution independent, the same fonts can be used for printing at any point size and in any of the four supported print rotations. A wide range of outline font type styles in a variety of language families are also available as resident fonts on the InfoPrint 5000 printer's hard disk. Outline fonts can be downloaded to the printer from host libraries. Raster pattern fonts at 240 dpi and 300 dpi are supported in SBCS and DBCS formats. However, for the best quality, outline fonts should be used. Non-resident Raster fonts must be downloaded from host libraries in the resolution and size required for printing. Font sizes from 4 to 72 points (approximately 1-inch high) are supported. You must verify the legibility of the 4-point font sets in their applications. Only one copy of a font is required for all four font rotations in the printer. The font is oriented for printing at print time. Raster fonts are supported by all host platforms. Printer-resident and host-downloaded outline fonts are supported by all host platforms relevant to the Infoprint 5000. The outline fonts listed below are provided on the hard drive on the Infoprint POWER Controller. Courier Roman medium 12 pitch (10 point) is the printer default. The following fonts provide compatibility with the resident raster fonts included in the 4028 Page Printer, as well as the most common typefaces of the IBM compatibility fonts traditionally provided in the AFP Print Services Facility products. The publications listed below are shipped with each Model AS1, AD1, and AD2 printer. If available, these publications are shipped in the appropriate language. The following publication is available and is meant to be used prior to the printer installation. The following is a summary of the initial order specify codes required to order an Infoprint 5000 Model AS1, AD1 and AD2. Specify one language feature for each model AS1 and AD2. The printer power cord is shipped based on the defaults for each country. An exception is that FN 9986 must be specified if the 6-foot Chicago Printer Power Cord is required.